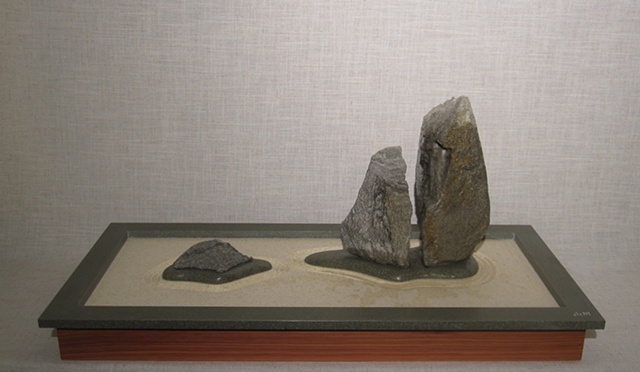 This abstract interpretation of a traditional dry landscape (karesansui) was inspired by Shigemori’s innovative approach to traditional Japanese garden design, using reclaimed natural and manmade materials. The garden's perimeter, “raked” surface, and the sculpted mounds on which the stones rest are fabricated from reclaimed Corian countertop remnants. The garden rests in an outer tray of cedar, reclaimed from surplus closet lining. The miniature waterfall adds motion and sound to the composition, but is prevented from flooding the surface by the “raked” grooves surrounding the stone. Cedarwood essential oil added to the waterfall reservoir further enhances the sensory experience.